Ordering at McDonalds in Japan is difficult. This issue was brought to my attention by a friend some years ago, before I came to Japan. I’ve thought about it recently in conjuction with some thoughts I had on Japanese language requirements for visa holders (which I’ve come to fully support, maybe a bit after the fact). Back to McDonalds. Food is a basic necessity. Getting some from any convenience store is as easy as choosing what you want, handing it to the person at the cash register, and paying for it. At first glance, ordering food at McDonalds should be no harder than saying (or pointing at) what you want and paying for it. If this were true, it would be easier than buying food at the convenience store since there are only two steps and you don’t even have to carry your items to the cash register. I’m sure many Americans recognize the golden arches and are lured inside with the promise of a tasty bit of home. But what awaits them is often confusion and frustration. For those who may be confused or frustrated, here’s a short guide to ordering at McDonalds in Japan. Step 1: Get in a line. 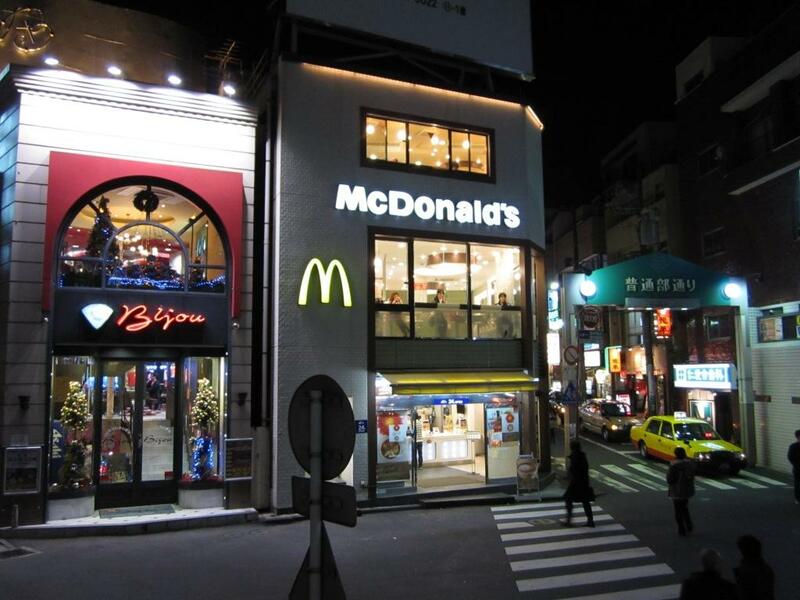 Upon entering a McDonalds in Japan, you must decide which line to stand in. Most Japanese McDonalds have signs which diagram how to make straight lines infront of open cash registers. These are conveniently written in Japanese with people represented by simple pink-orange circles. Customers who don’t stand in one of the predetermined lines will most likely be ignorned (especially if the store is busy). Step 2: Order. This is the hardest part since a barage of questions (asked in Japanese, of course) must be answered. Eating here or to go (koko de meshiagari desuka–will you eat here)? Do you want a set (fries+drink) with that (setto wa ikagadesuka)? If you had a drink, what kind of drink do you want (nomimono wa ikagadesuka)? Even if you know the polite form of each question in Japanese, the person at the register may ask them out of order or with slight variations to throw you off. They may even ask unexpected questions: Is the “M” size okay (emu-saizu wa yoroshiideshouka)? That will take a little while, do you mind waiting (…omachiitadaitemo iideshouka)? Maybe the machine for your drink is out of order. In this case, the McDonalds employee will appologize for the inconvenience (moushiwakenaidesuga…) and you’ll have to select something else (assuming you understood which item you could not have). Step 3: Get your order. This seems simple, but it may not be. The cashier will tell you one of three things. Here they are in order of increasing difficulty (for you to understand). 1) Please wait. You simply stand where you are and they’ll get your order and hand it to you. 2) Please wait over here. In this case you must go to where they pointed and wait. Most likely they want you to move out of the way so they can get the next person’s order. Someone will hand you your food over the counter. 3) Please have a seat and wait for this number. This is the most difficult case. You’ll be given a plastic plate with a number on it. You should get out of the line and stand/sit off to the side so others can place their orders. Eventually someone will come to you and give you your order. As you can see, ordering at McDonalds can be quite complex. I think that most students of Japanese do a lesson where they roleplay ordering at a restaraunt. Maybe teachers should opt for a more practical McDonalds lesson, including appropriate keigo. Also note that pointing in conjuction with random noises may be effective when ordering, but exercise caution not to scare the cashier or people in the next line. I am happy to report that I have recently received a TEFL (Teaching English as Foreign Language) certification. I completed online coursework at i-to-i related to areas such as how to teach grammar, speaking, writing,…..the list goes on. The course material taught me many new and interesting teaching techniques, opened my eyes to some issues related to teaching, and has made me an overall more focused and thoughtful teacher with a bigger toolbox (of teaching materials/methods). Although the online course provided no classroom experience, I was lucky enough to have had previous experience teaching English and continuing students for the duration of the course. I actually tried different techniques with my students as I learned them. Those students who have been with me for the past few months probably noticed at least minor changes in the way I’ve been conducting lessons. To those students, thank you for your patience and sorry you were used as guinea pigs, but you can rest assured that I and my lessons have become better at teaching English for it. For people teaching English, I highly recommend any type of TEFL training to those of you who lack it. You probably think you teach well and give your students good value–I did. To put it nicely, I didn’t realize how much better I could become until I learned some basic techniques and philosophies. To put it plainly, I though I was pretty good at teaching, but in reality I was not. The first time I saw a video of an example lesson in the online course I realized how unfocused and sloppy my lessons were. After doing the coursework, I feel that I have gained the tools necessary to shore up my weak areas and push forward to new highs. For students learning English, as you can tell from my comments above, TEFL training makes a big difference in your teacher’s ability to give good lessons. I will say the following…..If all you want out of your lesson is a conversation, then any English speaker is good enough. You can probably befriend a native speaker and get free conversations. But, if you want more than just a conversation–if you really want to learn some new English and not just use the same old words and grammar you already know, if you want well prepared and thoughtful lessons–then you should consider finding a teacher with some TEFL training and experience teaching. Some people know that I often enjoy drinking wine. I’ve had many good bottles over that past 6 or 7 years of (legal, of course) drinking, both older and younger than I. My brain seems to be bursting with things I’d like to say about wine–how I came to be interested in it, how I recommend everyone learn a little about wine since blind buying can be worse than gambling, I can keep going–but I want to talk about one of the best (THE best in my opinion) bargains in the world of fine drinks: LOOSE LEAF TEA. No, I’m not talking about some fashionable tea with a high price tag like heremes or Boodles (the most expensive tea in the world ). I’m talking about single-estate, full leaf teas. The extreme high end: around $150 per pound, which might seem like a lot to pay for tea. But consider that one pound of leaves brews around 200 cups which works out to about 75 cents a cup of tea. Compare that with any other high end drink–or any other drink, period. But what’s so good about tea?. . . . read more at my other blog. I just started a new blog in my own website. Basically, I took the standard wordpress installation, installed it in my existing website, and changed the default layout to look like my site. I’m no expert at anything html/php/java…the list goes on….but, by using the simple instructions at http://www.jonathanwold.com/tutorials/wordpress_theme/, I was able to install wordpress in a few hours. My website has a very basic design. Although it is supposed to by for the entire family, I am the only one who posts or updates anything–though only occasionally….the website has been under construction for the past 3 years–on it. Maybe my family would use it if I gave them their usernames and passwords…..
Milk……Some people like it, others can’t stand to drink it. I often have milk in the morning during breakfast with my cereal or by mixing it with some protein powder (protein in the morning is like my coffee and milk beats water). When I’m at home in Hawaii, I enjoy drink Meadow Gold 2% Milk. The taste is rather neutral–not rich, not too dry, and not much smell–and of course readily available. In Japan, I’ve tried over 10 different brands of milk but have yet to find one that I enjoy drinking. I don’t appreciate the smell or taste of most milks and the one’s that are OK are just barely OK. I recently went to Kumamoto for the Japan Physical Society’s fall meeting. I was only there for a few days and didn’t have much free time. I got the chance to eat some typical Kumamoto foods. Probably the most interesting one was the ramen, which was heavily flavored with garlic–my bowl of ramen looked like it had several cloves worth floating in the soup. The flavor was bold and the noodles were quite good. The highlight of my trip was waking up in the morning, going to the breakfast buffet, and drinking the milk. I’ve probably just been deprived of good milk for too long. But, the milk was fantastic…..slightly rich and sweet with no offensive odor.